Every time I go here, it’s like going home. 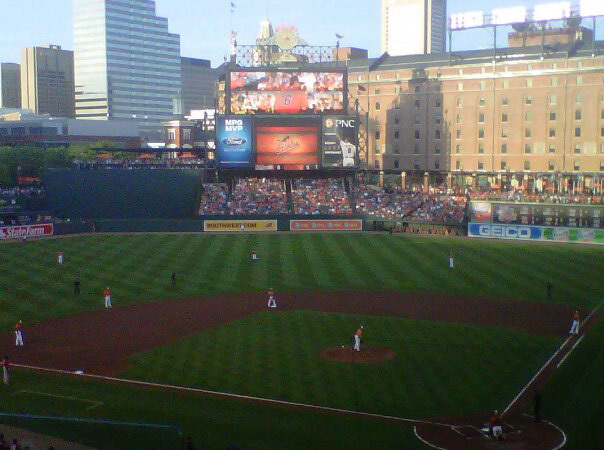 Camden Yards. There I sat, Saturday night, in some pretty fantastic seats at Camden Yards, watching the Orioles take on the Nationals at home. It’s a relatively friendly rivalry, but still, I was rooting my Birds on that evening. As the game neared the 8th and 9th innings, I got strange butterflies in my stomach, as I watched our pitcher hurl ball after ball into the catcher’s glove. I know why I got butterflies. For years, I’ve always believed that being a Major League Baseball pitcher is not only be the hardest job on the field, but also the loneliest. I don’t mind working hard, but I don’t like to be lonely. First, there he is on the mound. He is required to throw strikes—or at least hittable pitches—every time he launches something out of his tired arm. Whether it’s a slider, a curveball, a sinker, a fastball—whatever—his accuracy means something. It is required, unlike the accuracy of weatherpeople with whom we put our trust into daily. So the fact that the pitcher’s got to throw some decent balls into his catcher’s mitt is the first reason why it’s a tough job. Second, the pitcher’s out there in the middle of the field all alone. There was a sold-out crowd there on Saturday night, something Camden Yards hasn’t been accustomed to since the days when I was there: when it was new and Cal was breaking records or Davey Johnson got us to two consecutive playoff berths in 1996 and 1997. So, there’s a pitcher, on the mound, alone, with people all around him. And yet, even with the distractions of the wave, the Bird dancing on the dugout, people shouting obscenities, and just the general crowd noise, he’s required, again, to throw those strikes across the plate. His team is scattered across the lawn, and there he is, a lone soldier, trying to get men to swing. And miss. A hockey goalie’s job is tough; I realize that. But his teammates are skating by, acting as blockages for the little puck. A football team has men all around each other, serving as offensive props and defensive shields. Basketball players must work together as a team the whole time…no man stands alone…except during foul shots, but even then, there’s the power of the rebound. It’s my opinion that it’s the baseball pitcher that has the toughest job. Consistency, accuracy, endurance, and nerves of steel are required to fill the role. Oh, and you also have to not mind being lonely. You know what? I wonder if any pitcher, any baseball player, any sport speaker , any human on this word gave it a thought ever before?